Ukraine has renewed development of heavy infantry fighting vehicles (IFVs) based on the T-64 Main Battle Tank (MBT), Ukroboronprom has announced January 13. 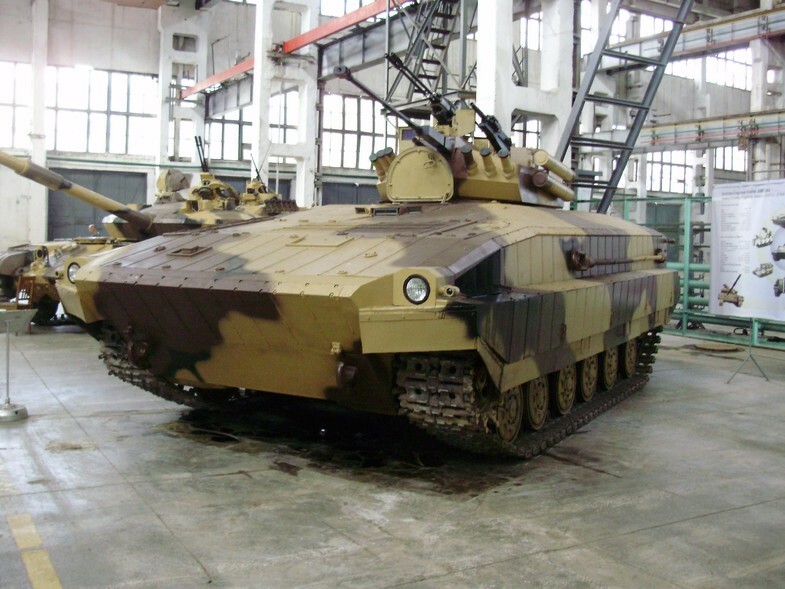 The Kharkov Morozov Machine Building Design Bureau had previously created prototypes of a new IFV based on the T-64 but work is understood to have ceased some years ago. Now the firm has resumed development of the heavy IFV in order to ready the designs for serial production. According to Ukroboronprom, this work could be completed in time to allow for mass production to begin before the end of the year. The heavy IFV is based on a heavily modified T-64 chassis and hull with its turret removed and the upper portion of the hull significantly raised in order to increase its internal volume and allow for the relocation of the engine forward. These changes allow the BMP-64 IFV, known variously as the BMP-64, BMT-64 and BMPT-64, to accommodate 10-12 dismounts in the rear of the vehicle as well as a crew of three. Instead of the 125-mm armed main turret of the T-64, a new IFV turret has been added to the vehicle. Boasting an impressive amount of firepower, the original prototype features a turret armed with a ZTM-1 30-mm automatic cannon and a 7.62-mm machine gun. Two anti-tank missiles are mounted on the left-hand side of the turret, while two banks of three grenade launchers are attached to the front of the turret. In addition, the commander’s hatch on the roof of the turret features a cupola armed with a twin GSh-23 mm cannon and a 30-mm automatic grenade launcher. The T-64 IFVs armour protection has also been increased with the incorporation of Nozh (Knife) advanced dynamic protection system (Explosive Reactive Armour – ERA), although a Defensive Aid Suite (DAS) was not known to have been installed on the original prototype. 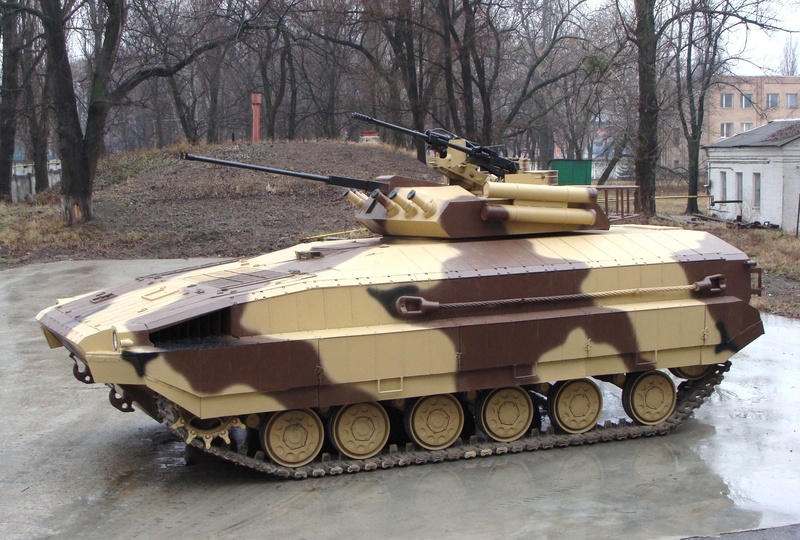 According to Ukroboronprom, part of the resumption of development of the vehicle will include efforts with specialists from the Ukrainian Ministry of Defence (MoD) to improve the design of the T-64 IFV. This will include improvements to the vehicle’s weapon systems and the installation of «more modern dynamic protection». The latter possibly refers to the Zaslon hard-kill active protection system, which has previously been installed on some T-64BM Bulat MBTs. 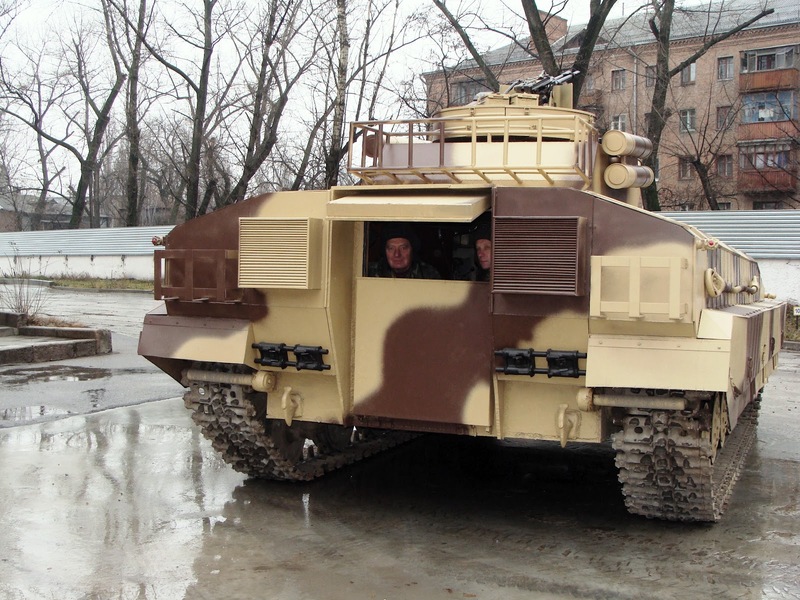 According to Nicholas de Larrinaga, Jane’s Defence Weekly correspondent, the Ukrainian military’s principal IFV is the ageing BMP-2, which offers protection only against small arms fire – and can be easily penetrated by shaped-charges, cannon fire, or even armour-piercing heavy machine gun fire. 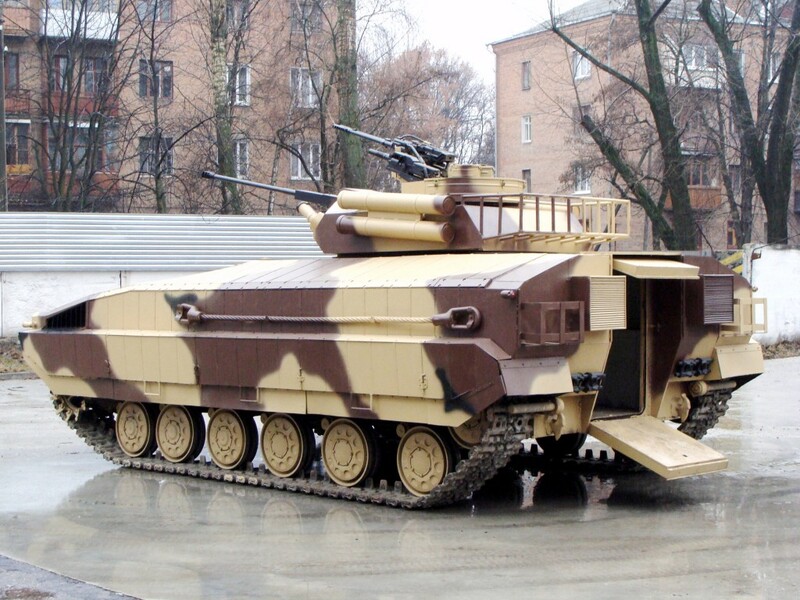 As a result, Ukrainian BMP-2s are understood to have been lost in numbers greater than any other vehicle type in Ukrainian service. While Ukrainian T-64 MBTs have also suffered a high loss rate, the additional armoured protection that a heavy IFV could offer would no doubt be welcomed by Ukrainian infantry and National Guardsmen. The T-64-based IFV is understood to weigh in at around 34.5 tonnes, making it well over double the weight of the 14.3 tonnes BMP-2 and more akin to the 32.7 tonnes weight of the U.S. Army’s Bradley M2A3 IFV. Converting MBT hulls into IFVs is not a new concept, with Israel in particular well known for converting first Centurion tank hulls, and now Merkava tank hulls into heavy IFVs – due to their utility in urban warfare, where speed is less relevant and all-round protection is key. The Ukrainian T-64 IFV is, however, dwarfed by the Merkava-derived Namer IFV, which weighs 62 tonnes.